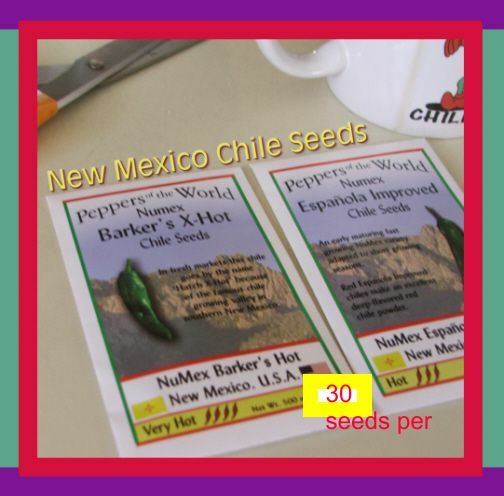 New Mexico Chili, NM Chili, NM Chile, New Mexico Chile, Hatch NM, growing seeds, Hatch New Mexico, Hatch Green Chile, Chile Gifts and more, Guajillo (wha-hee-oh)powder, green chile in a jar and growing seeds! NuMex Heritage 6-4 - Capsicum annuum (70 days) Improved variety with distinctive chile flavor and medium hot pungency. The 7� - 8� pods have 5 times more flavor than the original cultivar. When you roast them the sweet smoky green chile aroma is stronger and so much more intense. The NMSU Chile Pepper Institute developed this new variety. Mild - Med heat. NuMex Heritage Big Jim - Capsicum annuum (77 days) Improved NuMex variety with distinctive New Mexico chile flavor and medium hot pungency. Large 9� pods have thick flesh and are moderately flat. The thick flat pods make these ideal for plate-size chile relle�os. The top selling chile. Mild - Med heat. NuMex Joe E. Parker - Capsicum annuum (80 days) Large 8� chiles have excellent flavor with thick flesh. This pepper turns from green to red quickly and has incredible production after the initial harvest. The great taste of this chile and its consistent heat level make it a favorite in New Mexico restaurants. This variety is an improved version of New Mexico 6-4 chosen by grower, Joe E. Parker and produced for gardener use in 1990. Mild - Med heat. Anaheim Chile - the mild long that originated here in New Mexico and was introduced by Franciscan monks to California is great for cooking purposes. Mild to very Mild heat. Chimayo - Capsicum annuum (75) days to maturity. Chimay� chiles are unpredictable. A single plant might produce some chiles as long as six or seven inches and many more that are shorter; a few might be straight and skinny, and some will be bent oddly into curlicues. Delicious flavor. Chimay� chiles make great red chile sauce. It tastes sweet and then hot. Some say hot, I think more Mild - Med heat. NuMex Espanola Improved - Capsicum annuum (78 days) An early maturing fast growing chile adapted to short growing seasons. It has smooth well shaped 5 � 6� pods that dry well. Pepper cultivars developed at the Agriculture Experimentation Station of New Mexico State University carry the designation �NuMex�. New Mexican chiles have been cultivated for hundreds of years in specific regions, and several distinct varieties have developed. 'Espa�ola' is one of these landrace varieties. It thrives in high altitude environments with short growing seasons. In 1984 Espa�ola Improved chile was developed at NMSU by Drs. Matta and Nakayama. It is a cross between 'Sandia' and the northern New Mexico landrace chile �Espa�ola�. Hot to possibly Xtra Hot for many. 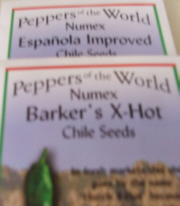 NuMex Barkers Hot - Xhot - Capsicum annuum (75 days) Very productive 24 - 36� plants produce pungent 5� pods with smooth skin. Pods dry well. Hot to Xtra Hot. NuMex Sandia - Capsicum annuum (75 days) Chiles mature early and produce well in high temperatures. Plants are 24� - 36� tall and the 7� pods have medium thick walls making them ideal for both fresh and roasted chiles. Early Jalapeno - Capsicum annuum (65 days) Chiles mature early and produce an abundant crop over the entire season. Grows well in cool temperatures and in containers. Plants are 24� tall and pods are 1� x 3� long with thick flesh. A chipotle (pronounced chi-POET-lee) is a red ripe jalape�o that has been smoked over a wood fire. Jalape�os are too thick to be dried properly. Chocolate Habanero - Capsicum chinense (110 days) This chile is glossy chestnut brown and 1-1/2� wide x 2� long. Harvest when it turns a chocolaty brown. Produces high yields. Habanero means from Havana and this extremely hot pepper is believed to originally been from Cuba and taken to the Yucatan Peninsula. Most say Xtra Hot, I say hot to Xtra Hot. Bhut Jolokia - Bhut Jolokia, Ghost Chile, Naga Jolokia, Ghost Pepper, and Naga Morich Capsicum chinense/C.frutescens (140 days) The 3� long and 1� wide pods turn from green to red at full maturity with rough dented skin. Warning: Handle with extreme caution and use hand, eye and breathing protection. The world�s hottest pepper at over 1,000,000 scoville units. High humidity will increase its heat. Thai Hot - Capsicum frutescens (90 days) Small 18� plants become covered with thin skinned 1 -1/2" long peppers that are green at first and then ripen to red. Both colors appear on the plant at the same time making this variety ornamental as well as edible. Thai chile peppers (Prik ki nu) are also known as birdseye chile peppers. Please note there are several items that are either seasonal or have time considerations attached, therefore delivery times may vary from our typical practices and products. Orders may not be processed for up to 5 days depending on volume at the time. We are not responsible for shipping company errors, accidents, or delays. If it's our responsibility such as shipping the wrong item, we will be responsible for replacement, but if it's lost by USPS, Fed Ex, or UPS, we do not accept the liability. Yes, we will work with you to exact what ever claim you make, but we are not accepting responsibility for their mistake/s. All orders are subject to availability. The fresh chile season typically begins late Aug., or early Sept. and lasts until mid Oct. Join our newsletter mailing list!